At Best Buy Auto Equipment, we help automotive business owners locate the equipment they need at prices they can afford. Regardless of what size wheels you typically work with, we have a wheel balancer to suit your needs. We offer a wide variety of wheel balancers, all made by some of the best brands in the automotive equipment industry. Wheel balancing is an essential service that can help you generate business and maximize profit. We carry both static and dynamic wheel balancing models to choose from. Shop from our selection today to browse models made by Coats, CEMB, Dannmar, Hofmann, K&L, Nationwide, Ranger, and much more. The Ranger Bubble Balancer has a rugged Die-Cast aluminum head cone to withstand continuous use. The Bubble Balancer is equipped with a Self-Leveling stand, so there is no need for leveling legs. CEMB wheel equipment for Gas Stations, small and medium size garages requiring basic computer wheel balancing for cars and light trucks. CEMB wheel equipment for Gas Stations, small and medium size garages. The B-100 Wheel Balancer is a highly accurate wheel balancing system that will balance wheels quickly and reliably. The Ranger DST2420 wheel balancer is a highly accurate and dependable no-frills balancer that features our proprietary Digital Sensor Technology for critical reliability and repeatability. Power Unit: 110V/220V 50/60HZ 1Ph. Power Unit: 1.5HP, 220V 50/60HZ 1Ph. 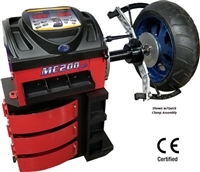 Entry level wheel balancer at an economical price that fits your needs. Entry-level machines designed for new shops or shops looking to expand service. Upgraded Machine for Faster Service. The DST-64T is a premium wheel balancer that is among the industry’s best. Our DataWand™ and inner data set arm allow you to enter wheel parameter settings in less than three seconds. Drive-Check™ technology simulates driving speed conditions and measures computer-generated imbalances. The Hofmann geodyna™ 7100 offers space-saving usability with belt-driven one-spin balance, VPM measuring system, user friendly 2D SAPE data entry and an intuitive control panel. Max. Wheel Diameter w/Guard: 44"
Max Wheel Width w/Guard: 23.6"
Formerly the 850, this wheel balancer can handle standard OEM tires up to 40" diameter and 130 lbs. The Hofmann geodyna® 7200s High Performance Wheel Balancing System is ideal for all shops - small footprint complimented by the video display provides high-end features in a compact design. Manual Entry: 8" - 30"
Semi-automatic Entry: 8" - 25"
Smart Sonar: 3" - 15"
The Hofmann geodyna 7600 series of wheel balancing systems are designed for professional tire stores, car dealships and multi-bay repair shops. Manual Entry: 8" - 32"
Legendary reliability with state of the art capability. 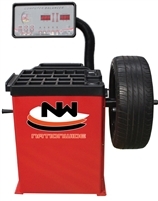 Tire Diameter: Up to 44"
Wheel Diameter Range: 8" to 30"
The CEMB Laser Wheel Balancer ER71, was designed with garages and car dealers in mind that need a wheel balancer for balancing today’s tires and wheels. The Hofmann geodyna 7400l wheel balancing system is designed to satisfy high-throughput customers. Semi-automatic Entry: 8" - 32"
The geodyna® 7340 wheel balancer is the ideal solution for independent tire shops, garages and dealers; offering high performance, small physical footprint and accurate balancing results in the first run. Our selection of wheel balancers features a model for motorcycles, standard size cars, trucks, heavy-duty vehicles, and everything in between. Garages and repair shops that service vintage cars with very narrow wheels need wheel balancing equipment that is easy to use. Eliminate check spin errors and other inaccuracies by investing in a quality static wheel balancer made by Coats or CEMB. These affordable models will eliminate static imbalance, provide a smooth riding experience, and reduce tire wear caused by excessive vibrations. 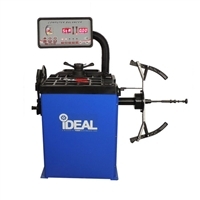 In addition to static wheel balancing equipment, we also offer a wide variety of dynamic wheel balancing equipment. Dynamic wheel balancing is ideal for any modern wheels that are wider than four inches. They counteract rotational forces on both vertical and lateral planes. Many of our dynamic models feature digital-sensor technology for reliable consistency, fast floor-to-floor times, drive-check technology to improve rotational measurements, and space-saving designs. Our selection of wheel balancers has something for dealerships, garages, gas stations, service stations, or any kind of automotive business. Shopping on a tight budget? We offer interest-free financing for up to six months on select products. You can submit your application today without any obligation to buy. Best of all, many of the products in this selection qualify for free shipping while supplies last. If you need any assistance along the way, we have an experienced and knowledgeable staff that is ready to answer any questions you may have. Call 1-800-647-7883 today to speak with one of our friendly representatives for further assistance or more information about wheel balancers.